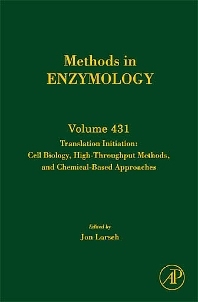 For over fifty years the Methods in Enzymology series has been the critically aclaimed laboratory standard and one of the most respected publications in the field of biochemistry. The highly relevant material makes it an essential publication for researchers in all fields of life and related sciences. This volume, the third of three on the topic of Translation Initiation includes articles written by leaders in the field. Biochemists and researchers in related life science disciplines.